Blog about your memorable Luxury Stay experience! Open roads awaited us. We felt as if the winds were talking to us. Our first destination was a rustic virgin beach on the unexplored Konkan coast. The Tall Coconut trees were gossiping among themselves probably talking about the uninvited guests who were going to come there. Blog about your memorable Luxury Stay experience in India and win exciting prizes! 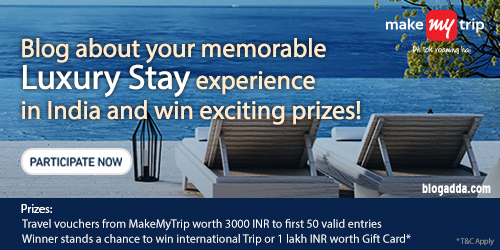 Travel vouchers from MakeMyTrip worth 3000 INR to first 50 valid entries. The word limit for every blog post is a minimum of 400 words. This activity is open only for Indian bloggers. Blog about your experience of staying in a hotel/resort only from this list. Focus of your post should be on the Hotel/Resort stay experience. Share your blog post on twitter with #MMTLuxuryStays tagging @makemytrip and @blogadda. Only blog posts submitted through this form will be considered valid. The last date for submission of this blog post is midnight, 5th February 2017. One blogger can write a maximum of 2 blog posts for this activity. Click on the button below to submit your entry! *Top blogpost will be shortlisted in the pool from which grand prize winner will be chosen. Being declared as top blogpost in this contest DOES NOT guarantee you will win the grand prize. This is my post 🙂 Enjoyed writing for this activity . Thanks Blogadda and MMT. Thank you everyone. Always ensure that the entries are submitted using the form link shared in the blogpost. @admin – By when can we expect the results ? Anyone else received mail from MMT regarding Blogpost submission in word format ? Yes, I have received it today. What are we supposed to do? I didn’t receive any mail from MMT. I am eagerly waiting for my voucher for first 50 entries. Any update?